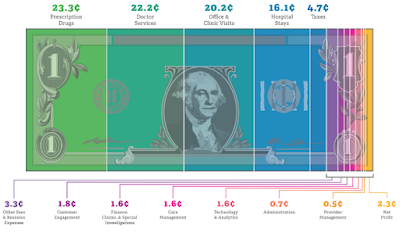 PBM's and More: In A World of Cost Plus, Is Transparency a Dirty Word? Peter Rousmaniere last week authored a two-part series that discussed Pharmacy Benefit Management companies (PBM's) and their pricing practices. He revealed that there may be undisclosed profits in their traditional contract systems, with rebates and negotiated discounts not being made apparent or passed on to the client customer. He indicated that a “transparency model PBM” might be a good choice for employers and insurers that would ultimately save them a good deal of money. No doubt he is correct; a transparent process that disclosed actual cost and manufacturer incentives would provide both savings and a better understanding of the activity. But I find myself wondering, given the setup of our industry, if this is an issue that reaches much farther than just the PBM sector. We should ask, for others in our industry, would transparency be a dirty word? We are enveloped in the world of insurance; an ecosphere based on assumption of liability and cost transfer. Many companies are essentially representing third parties, spending their client's money, and taking some measure of profit in the process. Insurance companies will pass on their costs in the form of premium rate changes or experience mod factors. TPA's can price on a transactional basis, managing claims for cost plus fees. DME providers, case management firms and more are all potentially subject to similar arrangements, often pitting cost as a basis for pricing. In the final analysis, it is all paid by employers, and the parameters of “cost” becomes the subject of greater discussion and debate. Indeed, it is the actual cost of pharmaceutical drugs that is at the core of the PBM discussion. I am a businessman. I understand and appreciate the importance of profit. When we sell services, it is hoped that our customers perceive value in those offerings commensurate with their investment. Profit is a good thing, indeed. However, if part of your sales approach is to convince customers that you will save them money by negotiating discounts on products and services on their behalf, the elements of actual cost, as well as your profit from the transaction, are certainly subject to scrutiny. And that is the world where transparency could be considered the enemy. Let's just conjecture on this a bit further. What if a TPA, working on a cost plus fee basis for an insurance carrier or employer, discovers that a PBM has not disclosed its full pricing discounts on the pharmaceuticals it pays for. It goes back and renegotiates new pricing with the PBM based on this new information. They have a choice. Do they take the reductions and pass those savings immediately to the customer, or do they receive “volume rebates” (or some other such payment mechanism) after the fact and keep those savings, essentially splitting the previously undisclosed profits with the PBM? I am not suggesting that has happened, but I am not suggesting it couldn't. Either way it would be a scenario where transparency could not and would not be afforded. I would suggest, for employers looking at these engagements, that the complexity of workers' compensation and its myriad of vendors and specialties creates ample opportunity for increased costs. Neither Rousmaniere or myself are alleging that anything illegal is being done; rather that there is opportunity for abuse enabled by ignorance and inattention. Tyrone's comment: A pretty bold statement made above one I happen to support. 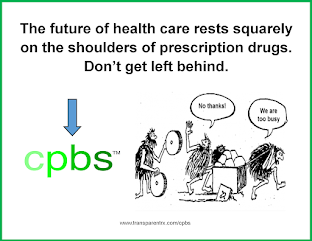 As much blame should be placed on the shoulders of unsophisticated purchasers of PBM services as the PBMs who take advantage of their inattention. For many employers, these costs are ultimately passed on through premiums or other cost-share arrangements. This reality provides even less incentive to drill down and ferret out true costs in these vendor arrangements. 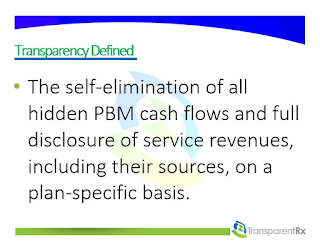 Hence, for some in our industry, transparency may be a verboten concept that extends beyond the world of the PBM. For those employers who engage, transparency will ultimately be the enemy of those engrossed in the world of undisclosed discounts or rebates. Any upstart competitor that promises true transparency in their pricing process could represent a real and present danger to the status quo.